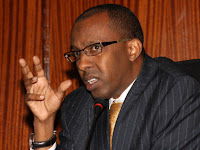 Monday August 27, 2018 - Renowned city lawyer Ahmednasir Abdullahi has shared his thoughts regarding the recent meeting between retired President Moi and Mombasa Governor, Ali Hassan Joho. On Saturday, Joho who was accompanied by members of the Mombasa County Assembly paid Moi a visit at his Kabarak home where they discussed a lot of issues affecting Kenyans. In May this year, NASA leader, Raila Odinga, also visited the ailing Mzee where they also discussed issues about his handshake with President Uhuru Kenyatta among other issues. Political pundits say that Joho and Raila are meeting Moi to frustrate Deputy President William Ruto’s presidential bid in 2022. But commenting on Twitter on Monday, Ahmednasir asked how Moi can inspire the future of our beloved country. "How can the old political order inspire/bless the new/inspiring future? I dont understand Kenya anymore," Ahmednasir asked. “The blessing or endorsement by Baba Moi must be the kiss of death for anyone who wants to be our next President," Ahmednasir added. Ahmednasir’s sentiments were echoed by millions of Kenyans who argued that Moi has nothing new to offer after his miserable 24 years in power.